254 pages | 41 B/W Illus. 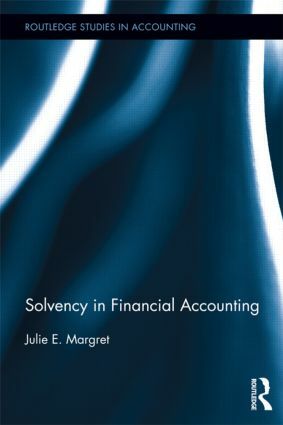 This book examines the notion of solvency at law and in accounting; and reveals inconsistent ways of determining solvency therein. Solvency is a critical commercial financial attribute. Quantifying solvency has been of concern to many across time, particularly with regard to business continuity. This study demonstrates that conventional financial statements are deficient in establishing the financial state of an entity, and equally lacking in quantifying its state of solvency. The book contributes to the literature by drawing on real-world observations of how the meshing of commercial and legal foundations creates the environment in which accounting must serve. The aim of this work is to provide insights into what changes to existing financial reporting systems might assist business in mitigating unexpected business failures and the criticism of accounting in the aftermath. Drawing mainly on major Australian cases, links highlight associations between the language of accounting and the data in financial statements; and situations that may be generalised - that have international significance. Hence, this work is relevant to the interests of a wide range of readers. It is also important from a public policy perspective as regulators grapple with a commercial environment heavily influenced by sometimes perceived scandalous corporate activity. Solvency is a topical and ongoing issue for business and financial accounting. Julie E. Margret is a senior lecturer in Accounting at La Trobe University. Prior to academe Julie worked in industry in financial and management accounting. Julie’s research interests include solvency, internal controls, phoenix activity, directors’ duties and governance. Julie’s PhD is from the University of Sydney. She has several papers published in academic and professional journals.